Meadowsweet contains salicylic acid which is what aspirin is. It has anti-inflammatory and pain relieving properties. Here is a simple versatile ointment recipe for treating all “dem aches an’ pains”. I used the leaves as they have a higher medicinal content with a few flowers (which also contain salicylates) for their fragrance. Put the leaves and flowers in a small saucepan and cover with vegetable oil. Gently heat, taking care not too boil or burn the leaves, for about half an hour. By the end the leaves will have started to get crisp. Remove from the heat and fish out the leaves/flowers with a spoon. Now add approximately one spoon of beeswax for every 6 spoons of oil. (You can also add a spoon of cocoa butter if you have it.) This will dissolve really quickly. 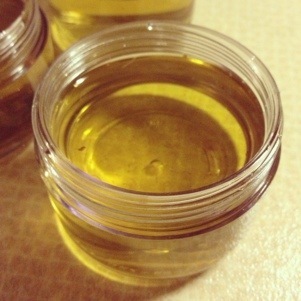 Then strain the oil through a mesh or net (not plastic – it may melt) into a glass jug. Take great care as the oil is very hot!! Now pour the liquid into little tins and jars and leave then to cool in a safe place where no one will knock them. Once cool you can put the lids on and use it. This particular batch is going to a friend with haemorrhoids, a friend with a sprained wrist, and some for my first aid box. That’s a great recipe! Thanks! How long will it store and do you need to keep it in a fridge? You don’t need to keep ointments in the fridge. Bacteria only breeds in water. Without an antioxidant it will be good for 6 months or so, add vitamin e oil or grapefruit seed extract for a longer shelf life. Thanks. Will add antioxidant in my next trial. First batch got burned so made the second batch on water bath. Added a spoonfull of coconut oil and together with meadowsweet it smells lovely. Hasn’t solidified yet so fingers crossed. Lovely smelling solid ointment. Thanks for the recipe!